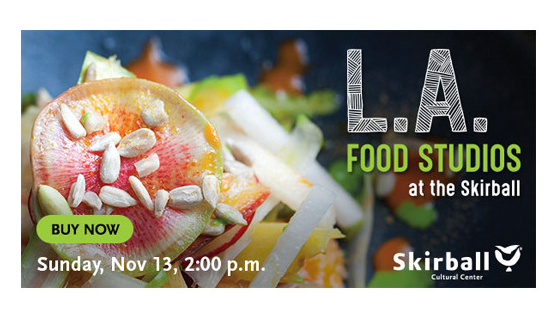 Programmed and produced L.A. Food Studios, creating a unique “open studios” setting, where six leading Los Angeles–based culinary artists gathered at the Skirball Cultural Center to show their process, talk to the public and share tastes of their signature cuisines. Considered among the city’s most creative and adventurous chefs, Kwang Uh of Baroo, Steve Samson of Sotto, Top Chef winner Mei Lin, Wes Avila of Guerrilla Tacos, Pawan Mahendro of Badmaash, and Rose Lawrence of Red Bread demonstrated how they create their signature dishes, answer questions, and offer ample samples for tasting. Attendees were encouraged to mingle with fellow foodies and explore the “open studios” at their own pace, stopping at each chef’s station to watch, hear from, and converse with the chefs while enjoying samples of their cooking. Each chef was partnered with an apprentice from the nonprofit organization L.A. Kitchen, which recovers fresh fruits and vegetables to support a culinary arts job training program for men and women coming out of foster care and returning from incarceration. The program was curated by Lara Rabinovitch, whose food writing has appeared in the Los Angeles Times, VICE, and Lucky Peach. Rabinovitch served as consulting producer for the documentary City of Gold about the renowned food critic Jonathan Gold.